For the last couple of years I have been watching my neighbours’ behaviour with keen attention. The cool ones, that is, who flash phones at their cars to open them, and drive off in a metaphorical puff of smug smoke which, if it were a cartoon, would formulate the words ‘I’m so cool, I’m a Zipcar user’. 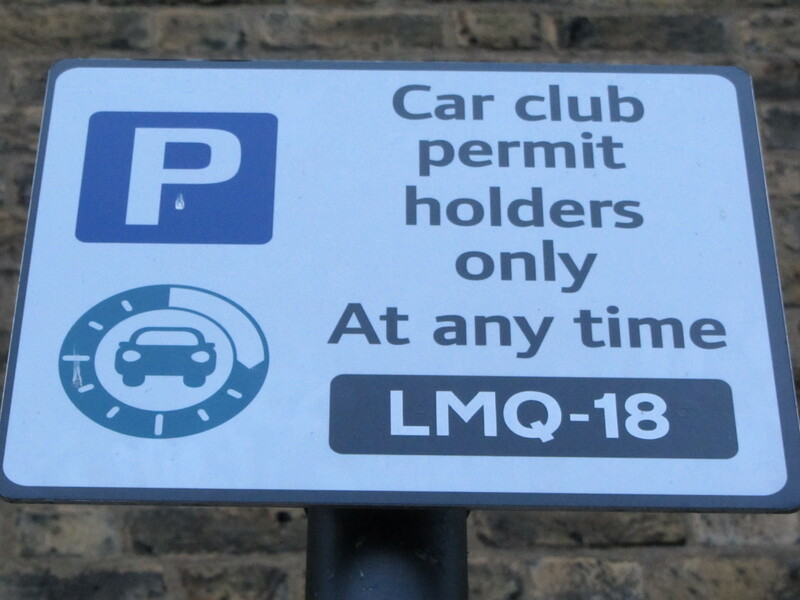 Zipcar is the UK’s leading car club organisation, with cars parked at locations all over London, Bristol, Cambridge, Oxford and Maidstone which you can reserve to use whenever you need. It also has branches in USA, Canada and Barcelona and growing. My curtain twitching has meant that each time the dreaded annual demand (with proverbial price hike) for car insurance to be paid on my battered but faithful old family Volvo arrives, I have sat and done the sums and tried to work out whether I could make the leap from car owner to car club cool. The fact is that the sums came out pretty equal, when I also included the cost of hiring a car once or twice a year for longer excursions if and when necessary. But for two years I have put off making the decision, mostly out of laziness I admit as it clearly wasn’t going to cost me any more money. But with two kids who need transporting here there and everywhere, I confess that I love the convenience of my car. I always have. However, we live minutes’ walk from a London underground station, the kids walk to school, we all own bikes and so in reality we only use the car twice a week at the most. So, in my heart of hearts, I knew which way I had to go with this car attachment issue. And then the decision was made for me a few weeks ago, when the Volvo finally passed away peacefully into its own little puff off knackered radiator smoke and I knew exactly whom to call. Zipcar. After checking on their website that there were about five cars within a 1.5 mile radius of our home I called them up, and within half an hour I was reserving my first shiny new Volkswagen Golf. The whole transition from car owner to car clubber just kept getting cooler after that. The annual fee is £59.50 with an additional hire cost of £5 an hour during the week or £6 at weekends. And here’s the best bit – as long as you don’t do over 40 miles, the petrol is free too, and of course no insurance. And you don’t pay London’s Congestion Charge either, although I always use public transport to go into the city centre during the week anyway. The staff were incredibly helpful when I phoned up to register, without a hint of hard selling. Within minutes I found myself having a conference call with the DVLA to approve my driving licence details, during which I downloaded my Zipcar app, and then I was done. Free to drive. Plus they do have special offers, so keep an eye on their site. 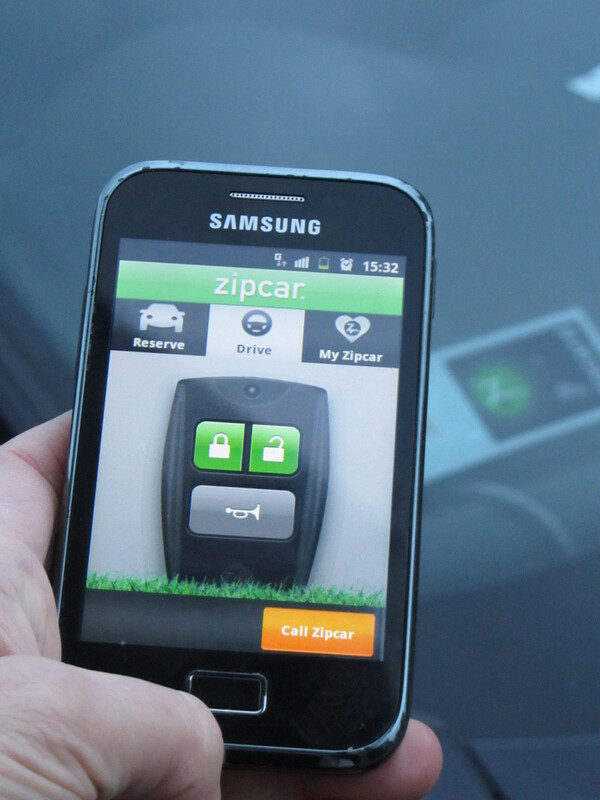 You also get a Zipcar card sent in the post which enables you to do everything you need to use the cars, but if you have a smartphone you can drive straight away, simply by using the cool app. I just reserved the car that I needed for a couple of hours using the app, and then walked over there, which took five minutes, hit the ‘unlock car’ button on the app, and click, the door unlocked. I chanced my arm to see if I could get the use of it earlier than planned, as the car was sitting in its special car club parking space not being used, but it wouldn’t unlock until bang on the time I had reserved it for. When the car was unlocked, I found the ignition key inside, and off I drove. Well, after adjusting my head from manual to automatic, that is, and calming my kids down as they played with all the new buttons and revelled in the fact that there was actually a CD player, not an archaic cassette thing. 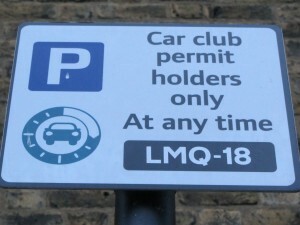 If you are late returning the Zipcar to the place you got it (it’s not like city bike schemes where you just drop them at any old Zipcar location, you do have to bring it back to where you got it) there is a fine of £35 per hour which is steep, so you have to be organised. Which generally, I am not, but I am learning. So, for example, I drop the kids at one of their things, while I take the car to the supermarket, collect the Christmas tree or whatever and then ‘zip’ back to get them. And if you are running late, you can extend your reservation when you are out and about, no problems, as long as it hasn’t already been reserved by someone else. The only thing that I have to adjust to is the notion of paying £20 to do a rugby club run. That still feels like a lot of money to me, so of course you have to change your mindset about this, and remember that you are not paying petrol, insurance, breakdown tax, MOT and car maintenance costs. Plus the car which is closest to my home isn’t always available, so I have got into the habit of cycling to the nearest alternative and locking my bike to the Zipcar post (which has a convenient metal loop on it for this purpose I presume). With petrol, the deal is that you are a good club member and fill it up when it goes under a quarter of a tank, using a payment card which is in the car. Because, again I say, I don’t pay for petrol! And all in all, my kids love the fact that I have a ‘posh’ car, I love the fact that I have a reliable one (it comes with full breakdown cover if anything does happen), and we are all coming round to the realisation that we don’t need to own a car in the city anyway. I have booked it for every rugby and cricket training session for the next year, as you can reserve it well in advance, and have had no problems so far booking it at short notice. We are still in transition, but it feels good so far. If the kids were still babies, I would think differently for sure, but now it suits us all fine. And if I were young, free and single again, this would be just ideal. In fact, it has to be just about the best present to buy any young city dweller, which might solve a few birthday or Christmas present quandaries too. In the meantime, check out the video below and get zipping. It might be just up your street. Join Zipcar and get £25 in free driving – Note one year later: I have just renewed my subscription and loving my Zipcar. Couldn’t recommend it more highly. This entry was posted in Articles, Guides & Gear and tagged car club London, car hire London, green London, Zipcar, Zipcar London. Bookmark the permalink.